I wrote some general tips for the Fundamentals of Engineering Exam in a previous post (link). Here are test taking strategies to go along with those. Overall strategy: Become an expert in the subject areas that you are most familiar with and know the basics of all other subjects. There is a reason the engineering profession is split into specialties (civil, mechanical, etc); there is so much to know that it is almost impossible to be an expert in everything. Furthermore, we all have our own ways to solve problems. Those thought processes might work especially well on certain subjects and not so well on other subjects. I found that it is much more productive to focus on the subjects that I have a background in rather than try to learn an unfamiliar subject from scratch. 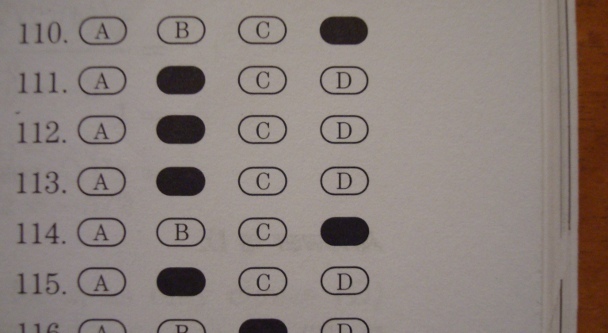 Guessing: The entire test is multiple choice with four possible answers. This means that if you completely guess, theoretically you have a 25% chance to get the correct answer. Further, if you are able to eliminate one of the possible answers, you now have a 33.3% chance to pick the right answer. Eliminating two possible answers leaves you with a 50% chance and, according to my study manual, a passing score on the FE Exam is a bit less than 50%. So, theoretically, if you were able to eliminate two possible answers for every question on the test, you should pass. Of course, this is not practical. In reality, there are some questions where you absolutely know the answer and some questions where you have no idea, but this does highlight the effectiveness of strategic guessing. I took the Fundamentals of Engineering Exam in October 2011. Two months later I received the results, stating that I passed (YAY!). Hopefully I can pass on a couple tips from my experience with the test! Waiting time to get results: Like I said before, it took me two months to get my results. I took my exam on October 29, 2011 and on December 20, 2011 I got an email saying “Your results from your recent NCEES exam have been released. To access your results, log into your NCEES exam registration account.” When I logged into my NCEES account I was able to see a message stating that I passed. I got an actual letter in my mailbox about a week after that. Calculator: The most important tip I can give is to get a good calculator and learn how to use it to the fullest extent. I’m partial to Texas Instruments (TI) calculators, so I looked up what was allowed for the exam. I found that, for TI branded calculators, “TI-36” must be part of the name. The most powerful calculator fitting that description was the “TI-36X PRO,” so I ordered it. I did a review of the calculator in a previous post (link). Bottom line is that it is a great calculator for this test. I know that some people take pride in doing calculations in their head, but during the morning portion, you will have so many questions to answer that you will likely be crunched for time. Some of the math questions on the morning portion will simply take a couple keystrokes on the right calculator. This time savings will help you when you reach the subjects you struggle with.